We had a wonderful Christmas. It was great having both our sons home for the holiday and between all the cooking and preparations I was able to sneak in some time to finish up one last batch of Christmas goodies for next year. Thank you, Tonya of Back Porch Pickins for this fun design! We aren't the only ones who have been busy this holiday season, however. Every now and then I come downstairs in the morning to find my dish towels have been rearranged during the night. What Happened to My Dish Towels? The first time this happened, I thought I must have been in a real hurry to wash dishes and made a mess without knowing it. However, the second time I realized there was another reason for this disarray. The culprit was stealthy and hard to catch. I've never actually caught them in the act, but have seen glimpses of them leaving the scene. I have my suspicions, but she is a crafty one and isn't talking, either to admit she's the one who does the work or why she isn't satisfied with my kitchen organization. Trying to get some things finished up before Christmas. Too late for this year's sales, but it's good to get a jump on the coming year. This large runner, about 40" by 18", is from a Maggie Bonanomi design. 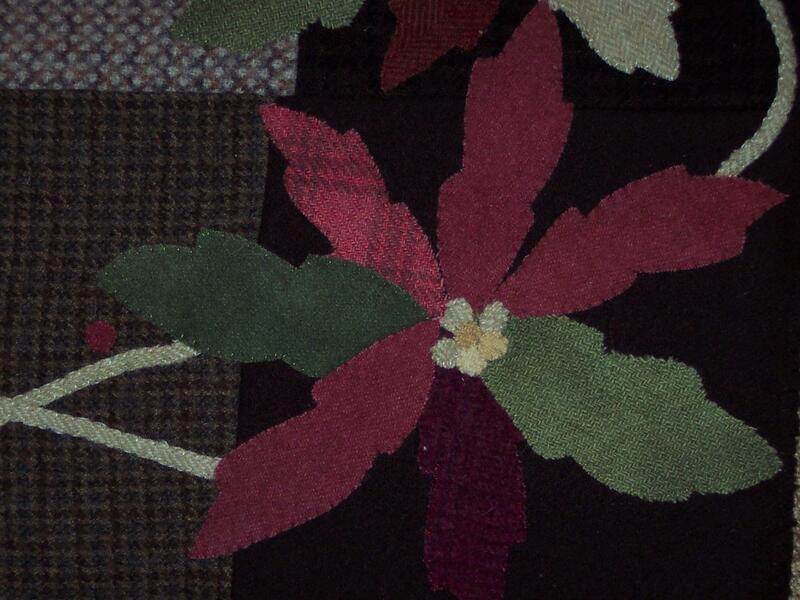 It features softer, faded looking poinsettias appliqued onto a variety of wool backgrounds. The backing is made from an old army blanket and attached by blanket stitch around the entire perimeter. I love the various shades of browns in the background. I think these add to the old fashioned charm of the design and blend well with the soft rose of the flowers. I also used a variety of textures, both for the background blocks and the flower bracts. I think that's the correct term for the poinsettia flowers, which are actually leaves and not blossoms. Across the meadow collapsed walls marked the position of another cabin. I believe some of these cabins were inhabited up until the 1940's. A radio probably was good company on long mountain nights. Our younger son arrived home from college yesterday. He goes to school about 12 hours away by car, so we don't get to see him much during the school year. For the next few weeks though we'll get to hear him practice throughout the day and into the night as he gets ready for next semester. It's hard to imagine when kids begin playing an instrument that it won't always be painful hearing them play, and then when they get to the point when they're really good, they leave! I included a photo of our front porch urn in my last post, so here it is again decorated for Christmas. 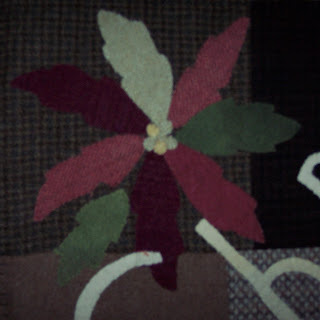 I used a lot of reds and green in this runner, but it's not really a Christmas design and could be used year round. This all wool runner is about 24 inches long and is backed with a red/black plaid homespun. The backing almost looks like homespun, but it is actually a taupe colored wool. It is an intricate and time consuming design, with several layers for each flower, bud and leaf. Here's a last peek at autumn decorating. I usually put mums or pumpkins in my front porch urns, but tried something different this year and this arrangement held up very well all fall. And then to add a little more color I filled an old wire laundry basket with little gourds and a festive mum. We didn't carve a jack o'lantern this year, so I was able to keep the pumpkin until Thanksgiving. We've had a mild fall. I walk every morning and most mornings only need a lighter jacket to stay warm, but I think we're in for a change this week. So I'm in the mood for Christmas and winter projects and really enjoyed making a bunch of these sweet, primitive guys. These are good sized ornaments at about 12" long, but I think they'd look good on a tree or wreath or would make a great package decoration for a primitive loving friend or relative. From a Robin Lousschen design. Somehow, the last few months just slipped away. But now it is fall and, with a couple of shows scheduled, it is time to get busy crafting again. Of course, the first show happened to fall on a week when I had a lot of work commitments and my sister and her husband in for a visit, but I managed to get a few things done. It was such a crazy week that I didn't get a chance to take photos of my new creations before they went in the tub for transporting to the show. So please forgive the price tags and busy backgrounds! This is a Maggie Bonanomi design--very simple and primitive. Cute design by Buttermilk Basin. Beautiful overdyed wool background. Pat and I set up yesterday and I snapped a quick photo of our booth before I had to run. I'm going to try to finish up a few more things tonight! We were very lucky to have beautiful weather for this year's antique and craft fair at the Bingham-Waggoner estate in Independence. We've had so much rain this year, but it stayed dry Saturday. We arrived early so we'd be set up and ready for the early bird shoppers. Leslie brought crafts and lots of wonderful primitives. She has a great eye for finding and displaying these treasures. I really wanted to get one new dolly made for the show, so I stayed up late Friday night finishing this Raggedy, adapted from an old pattern by Jen Steffa. This little gal sold, but I'm planning to do a Halloween Raggedy next. Shoppers continued to come throughout the day and our displays slowly thinned out. We enjoyed visiting with long time friends and meeting new ones. The lack of sleep before the show can make it challenging adding totals and making change, but everyone is cheerful and patient and we wouldn't miss it for anything (other than kid's performances and back surgery, that is). Even medieval royalty attend the show! I believe this is Princess Anne from Bohemia and her brother, who is escorting her to England to marry King Richard. Their dress seemed a little much for such a warm day, but constant movement and swishing of skirts helped the ladies retain their cool. I will be doing my first craft show of the year this weekend. I have been taking part in the Antique and Craft fair at the Bingham Waggoner Estate for probably about twelve years. Most of the time, I've done the show with my friend Leslie and sometimes another crafter. It's a great show to do and I always enjoy reconnecting with crafting and antiquing friends. I've made this design a few times, although I think this latest effort is my favorite. The background is an overdyed dark brown plaid and the pennies are blanket stitched in a dark brown. This mat would look nice on my kitchen table, but one of these days I'll get around to making one for myself. Another project I managed to finish this weekend. The background is an old flour sack and I added a favorite saying in stitches above the design. Some of the things I've finished over the past few months and will be taking to the show. I'm keeping my fingers crossed for a dry day. We've had a lot of rain and thunderstorms this summer, but right now the forecast is for a clear, but hot day. I'm very happy with the way this pillow, a Maggie Bonanomi design, turned out. I love the primitive look which the browns and muted colors lends to this pillow. What would summer be without strawberries? Last year I discovered the Primitive Gatherings gals and their designs and couldn't wait to get their latest book, Summer Gatherings. I like the use of tiny stitches with gold floss to simulate the berry seeds. And this goes great with my little primitive spatterware bowl. Our last car trip was to pick up our son from college in Michigan, take him to orchestra camp in beautiful northern Indiana, and return home with his stuff. This is what was left after he removed his duffle bag and quad trumpet case. I hope to spend the next few weeks in my studio completing many of the projects I've begun on our trips! Last weekend DH and I took part in our church's mission trip to Cedar Rapids, Iowa. Two years ago Cedar Rapids was flooded, with 14% of the city and over 5,000 homes under water. There is still a lot of rebuilding to be done. Our first day's project was to re-roof a small garage. The house has been rehabbed and is occupied. Most of the houses on this street have been repaired and are occupied, so we thought the owner and his neighbors would be glad to see the garage fixed and the blue tarp gone. On the second day we split up and part of the team finished roofing the garage, others patched and painted a house and DH and I cut subflooring in another house. It appears that most of the houses were built shortly after WWII. There is a great park and swimming pool a few blocks away. I can imagine the fun that kids had growing up in this neighborhood back in the 50's and 60's. Now, many to young couples just starting out are moving back in and hopefully, in a few years this neighborhood will once again see kids playing in the yard, going Trick or Treating or making snowmen. We recently took a trip to Colorado to visit our oldest son. We always try to hike in the mountains while we're there and this trip we took a trail that led up to the remains of several old homesteads. As we approached the meadow that held the remains of the cabins, we were amazed to see a car just off the path. When we reached the meadow the wind was blowing and snowflakes were swirling. I imagine the homeowner was very happy to have the hot bread and a warm meals that this stove provided. On a beautiful summer day, it probably would be easy to envy these early settlers. The view was beautiful. But on such a cold, blustery day in late spring, I marveled at their fortitude and hardiness.